DISMUI provides an easy-to-use user interface that looks similar to the known Image Build Wizard from Windows Embedded 8 Standard. You only need a few clicks to safely modify your existing Windows Embedded installation. The tool will do all the needed work for you in the background. DISMUI will take care that all installed language packs will be re-applied after a change. This ensures that all feature packages have their language files on the system. The tool also supports MUI pack DVDs as distribution spare source. All required feature pack dependencies will be added automatically by DISMUI. The tool will also take care that the dependencies of the installed Windows Embedded system are fullfilled so you cannot remove important files that make the system unbootable. DISMUI will calculate the estimated OS footprint when selecting or deselecting feature packages. This will inform you how your current selection will impact on the operating systems size. 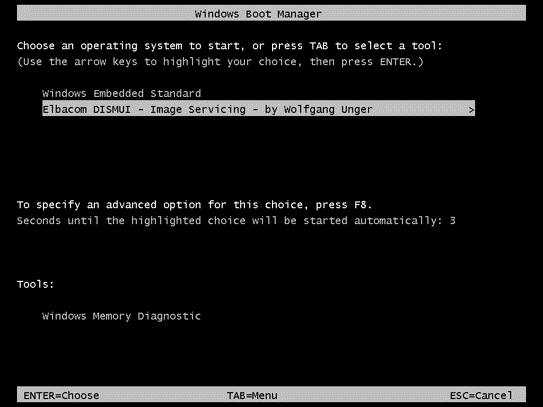 A Windows Embedded image can be serviced in online mode (currently running OS) or offline mode (image in a folder) – DISMUI supports both options and will automatically select the correct option depending on the system it runs on. DISMUI uses its own algorithm to remove modules in Windows Embedded 8 Standard. Normally this is not possible when using the DISM command. However DISMUI can safely remove any module from your image. This helps a lot while creating and testing your image. POSReady 7 does not support online servicing of the operating system. Therefore DISMUI offers the “Service image offline” option which will automate the offline servicing for you. The configuration can be done online but all the servicing operations will be done in an on-the-fly created Windows PE environment! This method can be used for Windows Embedded Standard 7 too. DISMUI has an enhanced function to recognize the OS it runs on, the OS you want to service and the you are using. These checks enhance the security of servicing your image because you cannot use a wrong package for your OS! When starting DISMUI it tries to automatically find the correct distribution share and catalog. Also the POSReady 7 MUI DVD will be recognized. 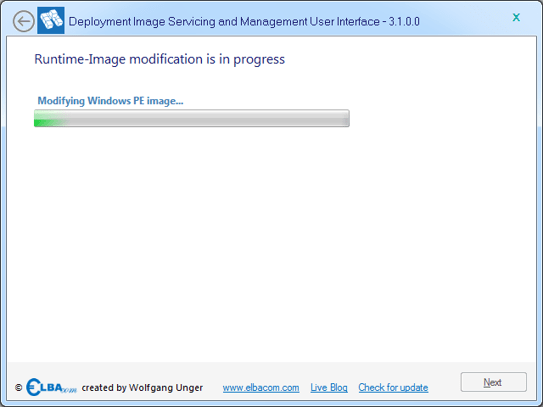 DISMUI can be integrated into Windows Embedded POSReady 7, so it allows end users to modify their image easily. If a specific driver has not been installed during the setup of Windows Embedded Standard 7 it can be tricky to integrate it manually afterward. For this scenario just launch DISMUI with the “Driver Installation” option and the tool will automatically integrate the missing drivers from the Distribution Share. DISMUI is built on the .NET 4.0 runtime which makes it possible to use DISMUI also from Windows PE 8. This enables you to create a portable version of DISMUI. Even if DISMUI runs on an OS that is not componentized, DISMUI can turn the Windows Features on or off. This way DISMUI will also work with Windows Embedded 8.1 Industry Pro! DISMUI now offers the ability to check for new updates from within the tool. 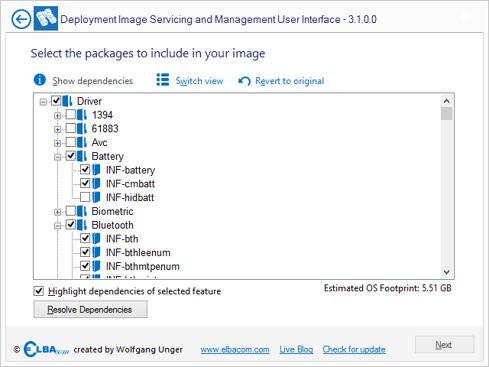 DISMUI is now part of the Elbacom Embedded Toolkit. Please let us know if you are interested and contact one of our offices. 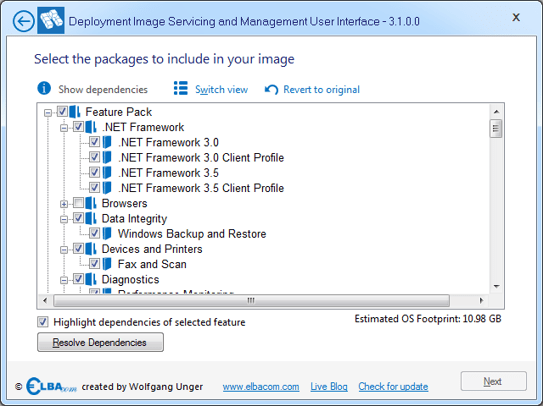 DISMUI allows adding and removing features and modules to a Windows Embedded image very easily. The tool will automatically recognize the Windows version is running on and will try to find the source directory for the components. To run DISMUI, you will need the .NET 4.0 Framework installed on your device. Insert the setup media into your device (OPK) or copy the Distribution Share or Catalog to your device. Then run DISMUI.exe from the Elbacom Embedded Toolkit (or from your download directory). Check if DISMUI selected the correct Distribution Share or Catalog. Leave the selection on the “Online” radio button and click “Next”. DISMUI will now enumerate all installed components and all available components. Check all features, that you want to add and uncheck all features that you would like to remove from your image. DISMUI will show you the estimated footprint impact of your selection (except for Windows Embedded 8.1 Industry). Once you have made your changes, click on “Resolve Dependencies” to ensure, that all required components are included. Also fix any possible conflicts – DISMUI will display a windows stating what needs to be done to solve it. Have a look at the summary and click “Next”. DISMUI will now make the changes to your image. Once completed, you will receive a message from the tool. If an error has occured, you can open the log file to see what went wrong. Windows Embedded POSReady 7 does not allow modifying the image while it is running. That means, that you would need to boot from the setup media and modify the image from the command line. As this is not an easy task, DISMUI can be used while the system is running and it will do all the changes offline automatically! To modify a Windows Embedded POSReady 7 image, just run DISMUI as described above. 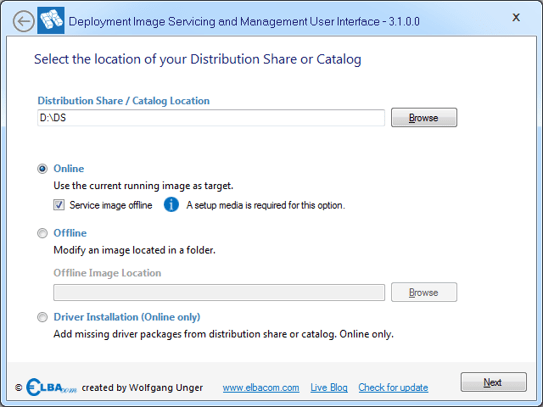 You will notice that the “Service image offline” checkbox is checked per default. Please note, that a setup media is required for this mode to work. Click “Next” to make your modifications. Check or uncheck features as described above. Then run the “Dependency Check” and click “Next”. Review your changes and click “Next”. DISMUI will now create a temporary Windows PE image, that will make the changes to your operating system while it is offline. This way you are still supported but don’t need to take care about the details. 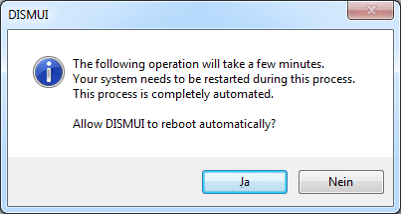 As this procedure takes some time and requires several reboots, DISMUI asks you if it is allowed to reboot automatically. DISMUI will create and modify the Windows PE image and will reboot the device into Windows PE. 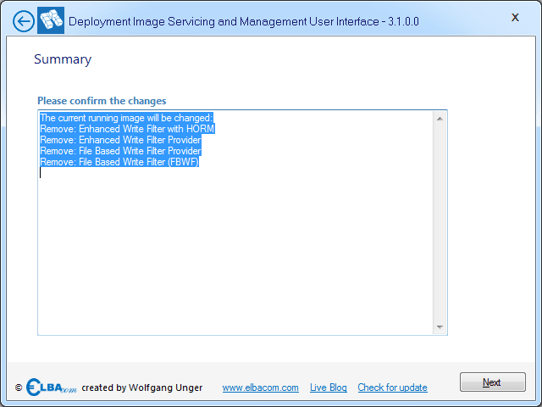 Your Windows Embedded POSReady 7 image will be modifed automatically from within the custom Windows PE. Once this is done, the Windows PE image will be deleted automatically and the system will boot into the modified Windows Embedded POSReady 7. As Windows Embedded POSReady 7 also allows end users to modify the system and it does not offer an easy way to do this, DISMUI also has a solution for this problem. Normally it would be required to boot from the setup media and modify the system from the command line. With DISMUI, it is possible to integrate the tool into Windows Embedded POSReady 7 so that it almost looks like the original “Windows Features” dialog. From there users can make there selection, if the setup media is present. The new UI does not require any special knowledge, such as running dependency check. Just make the selections and click on “OK”. DISMUI will then do the changes offline as described above. The integrated version of DISMUI can be launched from the start menu by typing “Turn Windows Features on or off” or by looking it up in the “All programs” folder of the start menu. 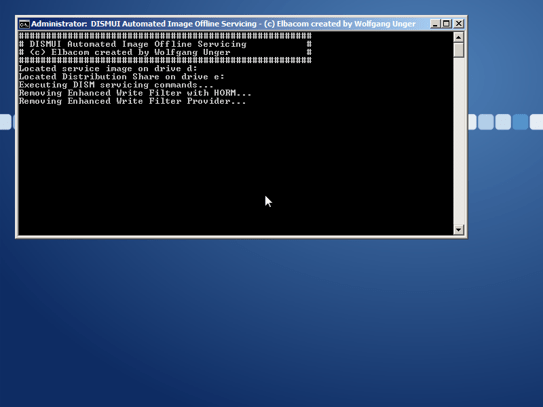 In Windows Embedded Standard 7 and Windows Embedded 8 Standard it is important to connect all devices during setup time. This is because the setup only install device drivers for the devices that are present during this time. Therefore it can happen that some devices will not work if they are connected lateron. Normally you would need to look for the correct driver package in your Distribution Share or Catalog manually. This can be a hard task, given the fact, that there are a few hundred driver packages available. With DISMUI you can solve this issue very easily. Just insert the setup media and run DISMUI. Select “Driver Installation” and click “Next”. DISMUI will now try to find a matching driver on the setup media. It will preselect all found drivers. You can add additional drivers, if required, or just click “Next”. Finish the wizard by clicking “Next” again. After a reboot the device should work. DISMUI can show the full dependency list of a component. It will not only show the dependencies of a component but also the dependents of this component. Meaning you will get a full list of all components that you, for example, need to uncheck as well to remove a specific component. 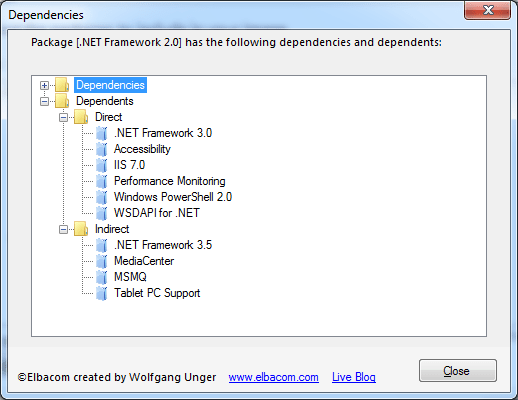 To view the dependencies just select it and click on “Show dependencies”.